TORONTO, September 13, 2018—Eskiminzin has faced difficult assignments in his last two starts, finishing fourth in both Fort Erie’s Prince of Wales and Woodbine’s Breeders’ Stakes for Canadian-bred three-year-olds. On Sunday at Woodbine, Eskiminzin will be looking to be a big fish in a smaller pond as he returns to Ontario-sired company for the $100,000 Vice Regent, a one-mile turf stakes which drew a field of seven Ontario-sired three-year-olds. Eskiminzin became a stakes winner here last summer in the Simcoe, a 6 ½ furlong Tapeta race for two-year-olds who went through the ring at the local yearling sale. The Cold Harbor colt was slow to find his sea legs this season but got back in the groove in the restricted Bold Ruckus, a six-furlong race run over a yielding turf course. Shipped to Fort Erie for his next start, Eskiminzin was soundly beaten over a track rendered very sloppy by a close-to-post downpour. Undaunted, Eskiminzin returned three and a half weeks later to stalk the pace of front-running winner Neepawa before weakening in the Breeders’ over 1 ½ miles of yielding turf. Underscoring Grant’s words, Eskiminzin tuned up for the Vice Regent last Sunday with a four-furlong breeze in a bullet :48.40 on the turf training track under Rafael Hernandez, who gets the call for the first time on Sunday. Silent Poet is the field’s only two-time winner on turf, having captured an open optional claimer over seven furlongs in his first start on the medium and then prevailed in the same company at six furlongs last time out under jockey Gary Boulanger. His most significant outing, however, could turn out to be a second-place finish two starts back behind the four-year-old Vanish. Claimed that day, Vanish returned to run second in the Grade 2 Play the King Stakes and earn a shot at Saturday’s Ricoh Woodbine Mile. “It’s a logical spot for him,” said trainer Nick Gonzalez. “I think turf’s his best surface. Silent Poet was well-beaten in his only try beyond seven furlongs but that came when he was making just his fourth career start in the 1 ¼ mile Queen’s Plate. Royal Laser, who has been in good form while competing in open optional claimers on the turf, is another leading contender. Trained by Sid Attard, Royal Laser finished second behind four-year-old Coleyville over 1 1/16 miles and then prevailed over older rivals at one mile. Be Vewy Vewy Quiet, winner of two restricted stakes as a two-year-old, rebounded from a dull sophomore bow to well when makings his turf debut and ending the runner-up to Eskiminzin in the Bold Ruckus. But in his only subsequent start, Be Vewy Vewy Quiet was outrun on the Tapeta in the open King Corrie Stakes. 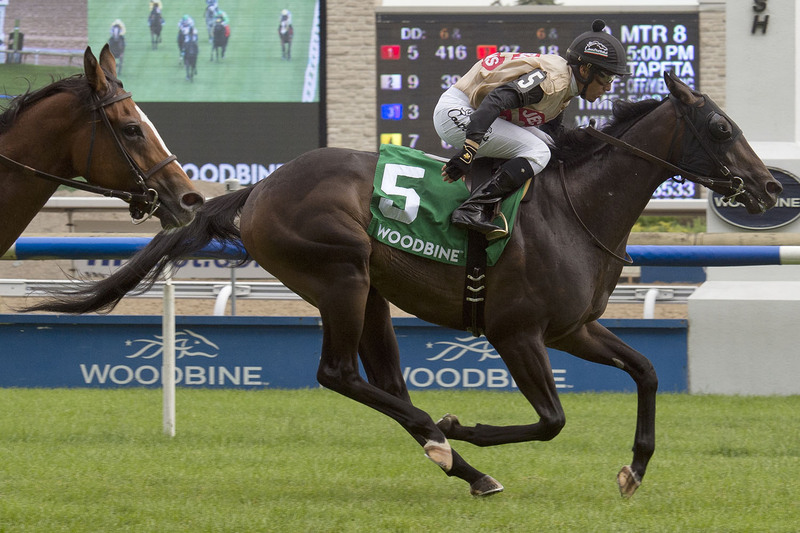 This entry was posted in Woodbine News and tagged Carlos Grant, Eskiminzin, Horse Racing, Ricoh Woodbine Mile Event, Vice Regent Stakes, Woodbine. Bookmark the permalink.